When wandering around the Osu Kannon neighbourhood in Nagoya one summer afternoon, we were lucky enough to stumble unto a ‘mochi making ceremony’ at a temple (mochitsuki in Japanese). Mochi are sweet rice cakes. The rice is first steamed and then placed into a mortar. One or two people with mallets pound the rice until it becomes a sticky and solid mass. During the pounding, the mass is turned over by someone moving his hand in and out in between the rhythmic pounds. 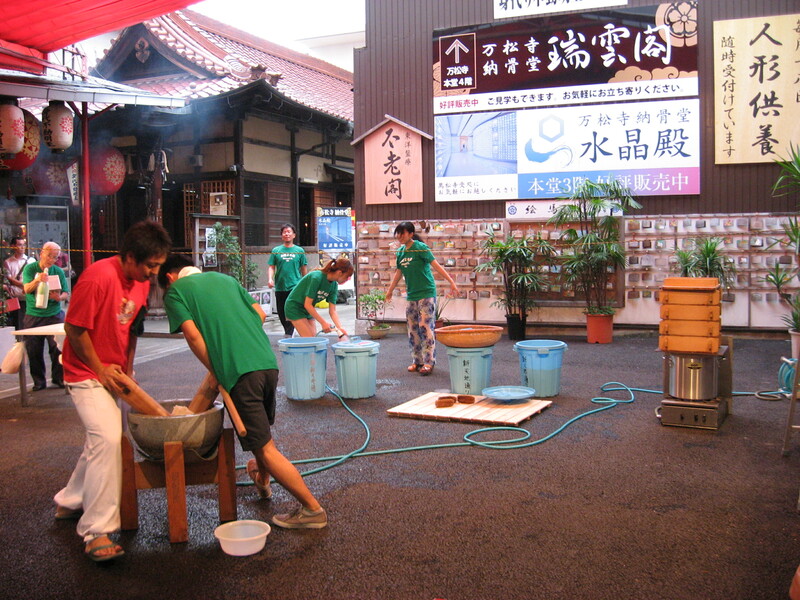 Mochi making in Osu Kannon. On the right you can see the rice being steamed in wooden containers. 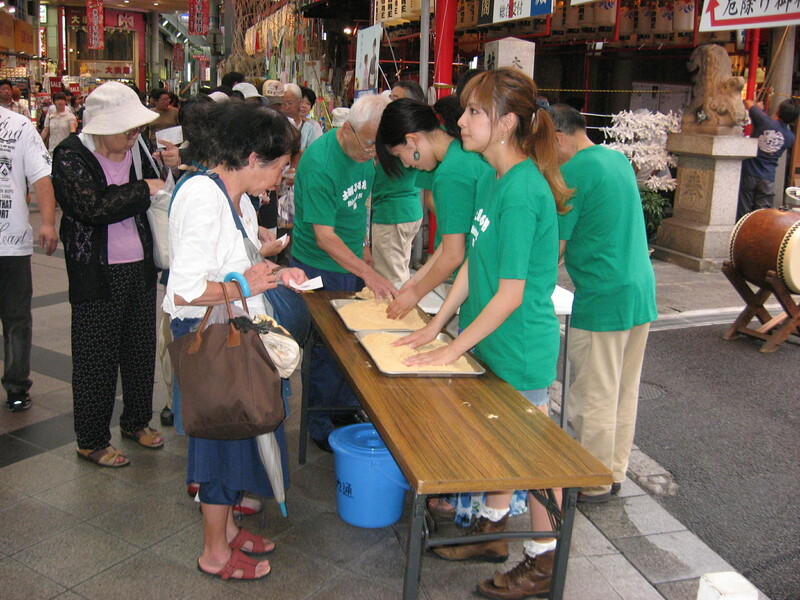 When the mass is finished, deft hands divide it into smaller pieces and dust it with soybean flour. Dividing the mass into smaller pieces and handing the mochi out. This apparently is a popular treat because the queue was endless. Queuing inside the temple - the queue goes on outside the temple as far as the eye can see. As we were watching the mochi making and considering whether or not to join the queue, a man came up to me and selflessly offered me his recently acquired and very coveted mochi. He just walked up to me, offered the mochi with both hands, mumbled ‘for you’ and dashed off. He disappeared so quickly I didn’t even get a chance to thank him. I was quite moved by this selfless act of generosity. Since then, I have had the good fortune of enjoying other similar tokens of selfless generosity from strangers. Just the other day I was offered a ticket to an ikebana exhibit by two ladies who saw me giving my only ticket to my sister-in-law who was visiting Japan. I wonder if I’m blessed with particularly good karma or if the act of giving just for the sake of it is something inherent to Japanese society. Such things have certainly not happened to me in Belgium. 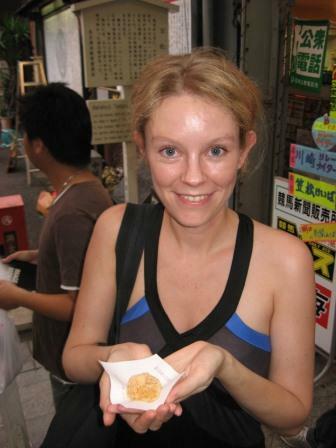 But then again, maybe standing out as a blond-haired gaijin helps a little too. This entry was posted in Culture, Food, Japan and tagged Food and drinks, Impressions of daily life, Japanese culture, Nagoya, Temples and shrines, The japanese mind by Haruko-chan. Bookmark the permalink. …om zo dankbaar voor te zijn…! Heerlijk…! Freshly-pound mochi is the best mochi you could have! Congratulations!